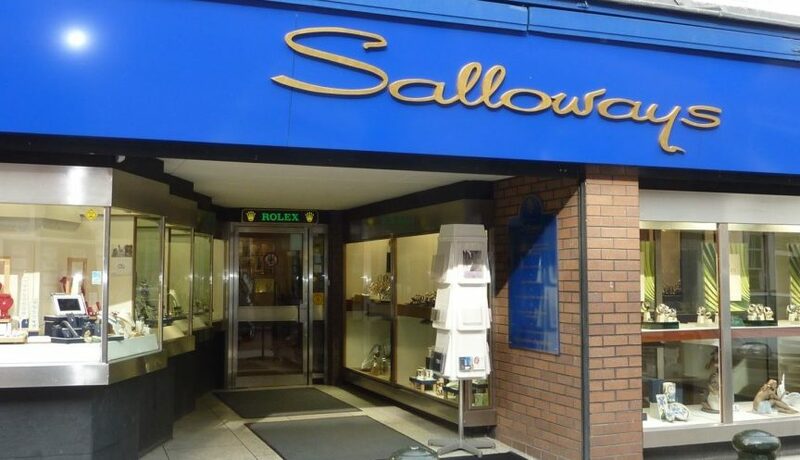 Family-run Salloways Jewellers has announced plans to close after almost 150 years trading in Lichfield. Owner Nigel Salloway, the fourth generation of the Salloway family to run the firm, plans to retire and has told local press that due to none of his three children wanting to take over the business, the store will shut its shutters for the last time. He tells Birmingham Live that this has been a “tough decision”. Salloways was founded by John Salloway who had worked as an apprentice clockmaker to Charles Thornelow of Tamworth Street, Lichfield, from 1861. He completed seven years of training and later took over Thornelow’s business moving to 25 Bore Street in 1884. When John Salloway passed away in 1900, the business was left to his brother William Salloway and wife Harriet Salloway. Harriet continued to run the shop and shifted the focus to jewellery and silver. Following a distinguished military career, William’s son, Frank Salloway took over the business in 1922 and eventually passed the baton to his son John Salloway. The current owner, Nigel Salloway, is the son of John and Mary and joined the company full time in 1984. Today Salloways Jewellers stocks a mixture of fine jewellery pieces, watches, and fashion goods by brands like Clogau. Before the store shuts it will be holding a closing down sales with discounts up to 50%. The sale will started Saturday, December 1.